1) Is it a zebra? Nope. Is it another species of horse? No. Is it a giraffe? Err.. sort of I suppose. Despite having black and white stripes, the okapi’s closest relative is the giraffe. 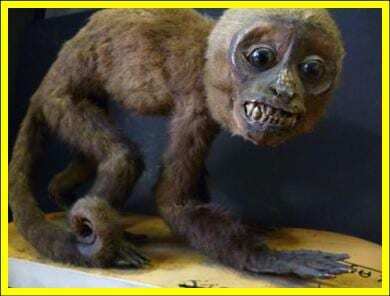 However it is the only species in its genus so really, it is one of a kind. 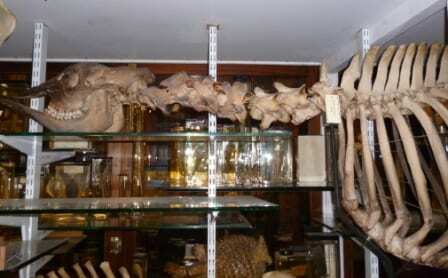 Despite being the size of a horse, its existence only became known to science in 1901. I say ‘known to science’ because of course, the locals of Central Africa where it lives had been aware of it for much longer. 2) The okapi is mainly dark brown in colour, with short hair. The striking area of the animal is its bottom. 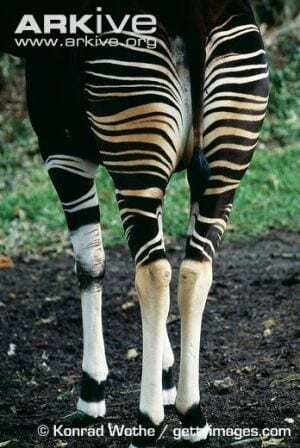 The okapi has black and white stripes like a zebra on its hind limbs, bottom and upper forelegs. The okapi is sexually dimorphic meaning that you can tell a boy from a girl without getting too personal. The male okapis have two small osteocones (they look like horns) on the top of the head, whilst the females go without. Females are also slightly taller than males, though unless you have one of each side by side, I challenge you to tell me which is which using this method. Both sexes have comically over-sized ears, all the better for hearing you with. 3) Okapis have an interesting diet. They eat leaves, grasses and fungi. Hold on, it does get interesting. Some of the fungi that they eat are poisonous. The masochists. They therefore also eat charcoal from forest fires (see how everything in nature has a purpose?) which is a very good antidote if you have recently ingested toxins. 4) Although okapis do not fight over territory, they do mark their home range. The male will urinate on its own front legs, which then gets transferred onto plants as it wanders through its range. They have also been observed urinating directly onto plants, as well as rubbing their necks on tree trunks to transfer scent. However, the majority of information that we have on the okapi’s behaviour is known from captive animals, as the home range of this animal is in areas that would be dangerous to carry out research in. 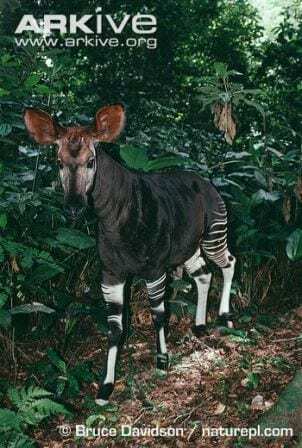 Once found in Uganda, its extinction in that country means that the only area in which the okapi is now found in the wild, is the war torn nation of the Democratic Republic of Congo. The beautiful stripes of the okapi. 5) Newborn okapis go through several phases of childhood. For the first few days of life, the newborn will follow the mother, who does not travel far, wherever she goes. The next phase is ‘nesting’ which the calf does for several months. During this period, the calf will spend all of its time either nursing or sleeping in the undergrowth. It does this until it can maintain its own body temperature at which point it becomes much more active. A male calf will start to develop osteocones around the age of one.